Time to have another go at Marengo (see the previous Marengo post for a more detailed AAR and the Shiloh post for an in depth look at the system) from the Musket and Saber series. I use the quick play version of the rules, which are actually intended to be used with the 'mini' folio games, so when playing the full sized folio games, there may be some areas of the full rules that players will need to dip into. I dislike the full rules from the point of view of too many sub systems having to be remembered for what is meant to be a simple game (see Boardgamegeek for the views of others on this point) and so the system is only usable for me with the quick play set, though at times, the full rules still need to be referenced. In the case of Marengo, we need to go to the full rules to adopt the Headquarters rule, as the scenario has a deployed headquarters counter for each side and they can have a significant impact on the game. It is best to use the rule in full, just ignore references to their effects on lines of retreat and FOW. An HQ has a movement allowance of 6 MP's. I would also recommend downloading the most recent set of Quick Play rules, as they include (in red) the errata covering the changes in combat results, which are important in making for a bloodier CRT and dealing with the problem of ineffectual rout. The new rules also include an optional addition to EXchange results. Basically the defender can choose to turn the result into a DR. I think I prefer the chaos that falls from the standard EXchange results, changing the result to a DR feels a little contrived. 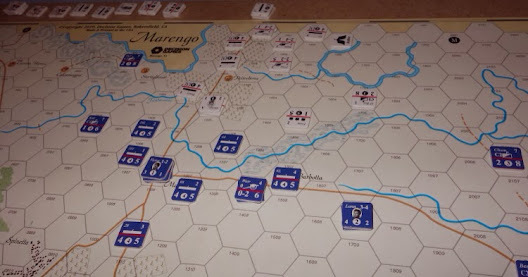 It can also unhinge a game, especially in a game like Marengo in which the Austrians start the game with a lot of 1 step units, while the French have plenty of two steppers. 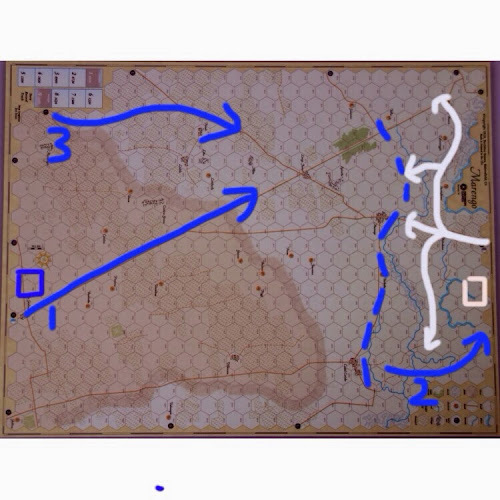 Since the burden of attack falls with the Austrians in this game, the optional rule would significantly effect them. Under the Quick Play rules, units will generally move faster as March Movement doubles movement allowances and then units using March Movement only pay half an MP on a road. 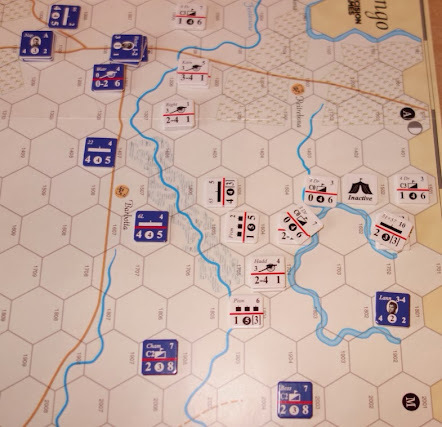 In this game, this helps the French as their reinforcements arrive at one end of the map and need to travel to the other end by road to join the affray. Once headquarters are active, their army can flip a reduced counter back to full strength each turn. It does not explicitly say so, but it seems only proper that a French brigade that voluntarily flips to release a separate battalion counter, should not then be allowed to return to full strength via this mechanic. I made some mistakes in my last AAR, most notably I did not use sequential arrival costs when moving onto the map (to reflect travelling in column), so the arriving Austrians got some extra movement and arrived faster than they should have. Todays game played out nicely. The French defend along the Fontanone stream, with the town of Marengo in the centre, hoping that they can hold the town long enough for their reinforcements to arrive. The French reinforcement arrivals are generally dice dependent, so as the French player, you can despair as your reinforcements get delayed and slide further down the turn track. 1) French Headquarters (Blue square) and the arrival point of Napoleon and most French forces. 2) The attack by Lannes that forced the Austrian Headquarters (white square) to retreat. 3) The random arrival point of Desaix, who although arrives late, does save the day. 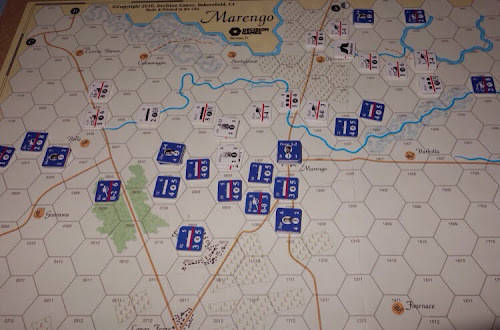 All the fighting stays up at the Marengo end of the map and as such, I don't really see much prospect for Austrian forces to threaten the French Headquarters, unless a rogue cavalry unit gets through. Depending on the overall situation, at just over 5 hexes to the mile, that might be a bit gamey if that happens. However, the Austrian Headquarters is near the action and therefore potentially vulnerable. In this game, Lannes would exploit that to the full. The first half of the game was taken up by the Austrian army arriving and spreading out along the nearside of the Fontanone stream, while demonstrating here and there, using their superiority in artillery. In the above photo you can see the remaining Austrian column off board, it takes several turns to get them all into play. 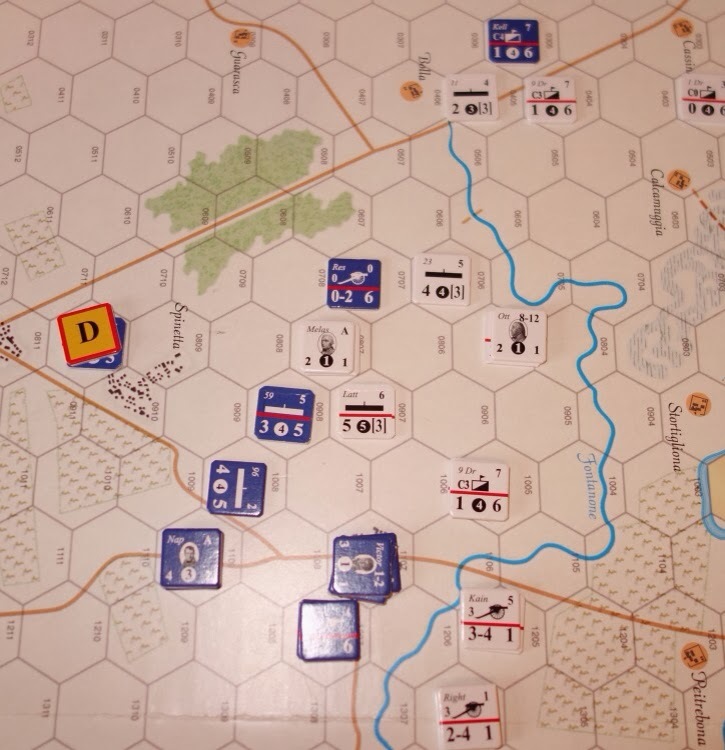 In the second part of the game, the Austrians (above photo) advanced on their right and unhinged Marengo (lower centre hex under the French leader counter). Napoleon (on the road to the left) was forced to intervene in person, taking part in a swift counter-attack to the hex adjacent (above) to Marengo and restoring the situation. 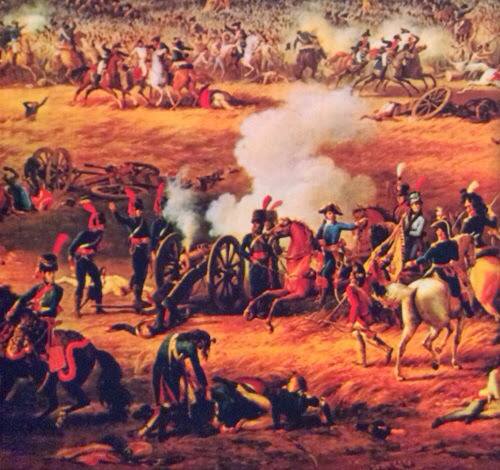 Napoleon then moved back out of harms way, as his loss would give the Austrians their victory. On the Austrian left, things quickly deteriorated. Lannes took the 40th Line and Bessier's Horse Guard cavalry and manoeuvred around the flank, closing in on the exposed Austrian HQ. The Headquarters was forced to retire three turns in a row. Movement causes Headquarters to flip to their inactive side, so during the last turns of the game, the Austrians had to dice for all their movement points, could not make march movement and could not gain replacements - a very effective move by Lannes, who in the face of heavy Austrian artillery fire, survived two 'leader' results in combat (a 33% chance of loss each time) - he was the 'Bravest of the Brave' (what do you think about that Marshal Ney?). During the last couple of turns, the Austrians launched an attack on Marengo itself, attacking from three hexes. This was made in association with an assault on their right against weakened forces in an effort to isolate Marengo. This attack was a serious threat, but the delayed forces of Desaix arrived just in time to hold the flank and the defences at Marengo held. The entire French army (above - positions at the end of the game) was now present on the field and the Austrians, outnumbered and hampered by their inactive headquarters, could not make a further assault without the risk of suffering heavy casualties. The French claimed a victory as they held Marengo and it was not encircled. Had the game gone to casualties then the tally was 6 units lost by the French and 7 lost by the Austrians (plus one unit that routed from the board). The tension in the game comes from whether the Austrians can get into Marengo (or isolate it) before the entire French army has assembled. As both a solitaire and a face to face experience, the scenario is enjoyable and re-playable, though the French never really seem to feel as 'threatened' as the Austrians do - so if teaching the game, give the French to the other player. My recent playings of both Marengo and Saalfeld has got the system back into my head, so I am ready for an outing with the bigger Leipzig game from the same series. There have been some concerns expressed about that design allowing the French an unhistorical freedom in pinning down the Allies. That has dampened my enthusiasm to play, but I think I will still take it for a spin. Great AAR by the way. I really need to get on with some of these, as I play quite frequently and always take pictures. Thanks, taking down notes as I play seems to enhance the sense of narrative that many games give. In the version you are presently playing, do the Austrians generally struggle to get much beyond the Fontenone Stream? They did struggle for a while. They have Engineers which are allowed to build pontoon bridges as long as they are adjacent to the river, and to succeed they have dice for it to succeed. They do eventually do it, but it does delay them, which is advantageous to the French. I too take notes and record events, but I seldom ever post my AAR/reviews on my blog, but I do aim to change that! I was interested to compare your Marengo map with the new folio version (which is 352 yards to the hex and Marengo occupies just a single hex). I note that Leisure Games is now importing Legion Games into the UK.